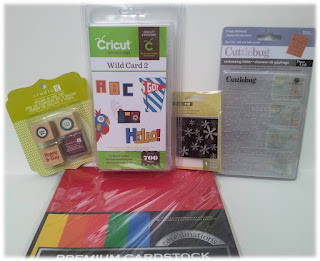 Scrap This, Save That: Susie's Happy Birthday Giveaway! Happy birthday Susie!!! Susie, over at Susie Craft Happy is having a birthday in a few days, and to celebrate, she's giving us lucky ducks a chance to win some awesome crafty goodness!! Just look at what she's offering! I wanna win!!! But just in case I don't, I hope one of you do! Head on over to Susie's blog now to enter! And while you're there, say hi and take a peek around. She does some AMAZING work, AND she's even been published in Cricut Magazine! She's definitely one of my bloggie heros!